Bell Rings for Lesson in Turkey with MOPAK Notebook! Keeping leadership in sector of printing and paper in Turkey since 1926 and being leader producer of paper and cardboard in Middles East and the Balkans, MOPAK makes a name for itself as a world brand with high rate of growth, product range from 25 gram to 500 gram, exportation to 36 countries and huge integrated plant in Dalaman. Everything started with visionary of founder, Mehmet Ali Molay! Dating to 1926, everything started when 1st Mehmet Ali Molay established the first printing house of the territory in Izmir Fevzi Pasa Boulevard and became a paper merchant. In 1930, E. Ruhi Molay, from second generation of the family, carried the printing to package sector. Third generation Mehmet Ali Molay graduated from Berlin Academy of Graphic Arts and established his own printing house after returning to country. In 1974, Mehmet Ali Molay moved his printing house in a new five-floor building and unified his power with father Ruhi Molay in İzmir Çamdibi. When Ruhi Molay passed away in 1979, Mehmet Ali Molay took over the responsibility. In 1983, the foundation of Izmir Kemalpasa Plant was laid and MOPAK Kemalpasa Plant came into operation. In 1984, the license was obtained for production of playing card. While 100% of playing card was imported, 95% of them was produced by Mopak anymore. This was followed by production of tipping paper and MOPAK reached to exporation volume of 12 million USD in Iraq market. In 1988, company made for internal market by intensifying its investments on stationary equipment, school notebooks and copy papers. In 1991, adding Bulgaria, France and TRNC into its export network after Iraq, Iran and Germany, MOPAK established MOPAK Education Center in order to provide training of journeyman and apprenticeship for the purpose of raising qualified personnel for paper sector. Company was granted many awards. In the same year, it was granted an award by Aegean Chamber of Industry in the Industrial Sector of Paper and Paper Products as second company, which made the most investment and provided the most employment, and as the third company, which realized the highest exportation. In 1992, it opened the first MOPAK Stationery Hypermarket, established within MOPAK Kağıt ve Kırtasiye Pazarlama A.Ş, in Izmir with the experience in stationery field. In those hypermarkets, to be opened in various cities of the country later, all the products within stationery field in were available in that Turkey. Meanwhile, capacity of paper production – main business – reached to 36.000 tons annually with an increase of 50% and capacity of notebook production reached to 6.000 tons annually with an increase of 100%. In 1995, to be initiated in order to interest of the students for art and to continue by becoming a tradition, Design Competition of MOPAK Notebook Cover was organized for the first time. In 1996, MOPAK Deutschland GmbH was established and became the center for exportation to Europe. In 1997, MOPAK carried into effect the MOPAK Cogeneration Energy Plant in order to produce its own energy. Maintaining its existence with social responsibility and sustainability, MOPAK established Industrial Vocational High School in the same year and the school initiated education with 16 classes and 600 students. In 1998, moving one more step, it established MOPAK Foundation for Education and Culture (MEV) in order to raise the creative and productive individuals, required by Turkish Industry, and to increase theis knowledge and experiences and to improve them from the social point. In 2000, obtaining the tender of privatization for Seka Dalaman, MOPAK started to produce first notebooks which were TSE-certified and complied with eye health in Turkey. In 2001, MOPAK Dalaman Celluloce-Paper Cardboard Integrated Plant came into operation. The sales volume of 50 trillion was realized and cardboard production was started after cellulose in Dalaman Plants. In 2002, MOPAK was awarded by Aegean Chamber of Industry in Industrial Sector of Paper and Paper Production as third company, realizing the highest exportation. In 2003, it actualized Project of Industrial Eucalyptus Plantation, to make contribution to Turkish economy and ecological system in Turkey, and initiated the creating project for Industrial Forests of Eucalyptus. It was granted an award by Aegean Chamber of Industry and Izmir Provincial Directorate of Environment as “The most environmentalist industrial enterprise”. In the same year, MOPAK took over Kastamonu-Taşköprü Cellulos and Cigaratte Paper Integrated Plant from Directorate of Privatization Administration. While increasing contribution on art aand cultural activities, the registration of “Most-known sectorial brand” was provided by Turkish Patent Institute with its modern technology and sense of quality. Moreover, it broke new ground by installing upper sieve on paper machine in Dalaman and by producing paper, whose both surfaces are same, smooth and all surface has same intensity. In 2005, the information infrastructure of all the plants was renewed and ERP application was set up. In 2015, E. Ruhi Molay, representing the fourth generation of the family, took over the administration of the company as General Manager. Being the architect of big successes of 100% Turkish capital, MOPAK is planning the future as one of the dynamos in Turkish economy with the young team and staff under the leadership of young and successful General Manager E. Ruhi Molay. Making contribution on country economy with its developed and actualized projects, MOPAK continues succeeding with its vision of being one step ahead, from waste paper collection to recycling and from eucalyptus plantations to supported social responsibility projects. Paper wastage and various paper cardboard packages, discharged paper process units in 3 factories of MOPAK are utilized in cardboard productions in cardboard machines on Dalaman factory and therefore recycling becomes available. Furthermore, company purchases from waste paper suppliers and purchase the archives of official institutions and organizations against its amount to use in recycling process and submits disposal certificate upon the demand and thus supports recycling considerably. Increasing its rate of growth day by day by using utilizing own resources, MOPAK breaks new ground in Turkey with “Industrial Forests of Eucalyptus” which it has actualized with its mission of raising awareness of comsumer and being environmentalist. Producing industrial paper with Eucalyptus Plantations, one of the most important source for Paper Industry, MOPAK makes investments on nature and environment and make contribution to new employment. Growing constantly by adding value to life and taking firm steps forward to become a innovative, available, passionate and reliable brand, MOPAK is getting ready for new educational term with its passion of paper and notebook groups, developed with quality, and new designs, vivid colors, qualified paper and wide range of product. Being the irreplaceable of the students and parents with hundreds types of notebooks, produced by considering the appreciation of female and male students from primary school to university, MOPAK Notebook is produced as per the requirements of the students from the point of quality and ease of usage. Number 1 colorful printing for primary school students! In MOPAK Notebook series, your favourite colors and energetic desings, suitable for your trend and mode, will be accompany you. In notebooks of calligraphy and music, pretty animal friends are accompanying the tiny students, starting school and learning how to write. Special car and football thema is ornamenting notebooks for males while pastel- designed notebooks are presented for females in preparation classes and class 1-3. Combining solid colored designs with simple designment percept from class 5-6, MOPAK Notebook aims to make possible the criteria, preferred and imagined by new generation children and the young for notebooks, with special designs for male and female and reflections of childrens from their daily life. In notebooks of “Laklak Series”, being inspired from daily language of children and young persons as of class 8, witty words in the simple covers make you smile. With freedom series, it refers to pleasures that the young persons feel happy and free in any field of the life. In the book-cloth effected series, it sends invitation to humour, socialness, act and love. MOPAK Notebook university series, that people can’t take their eyes off, is cute and funny as much as that of small brothers. 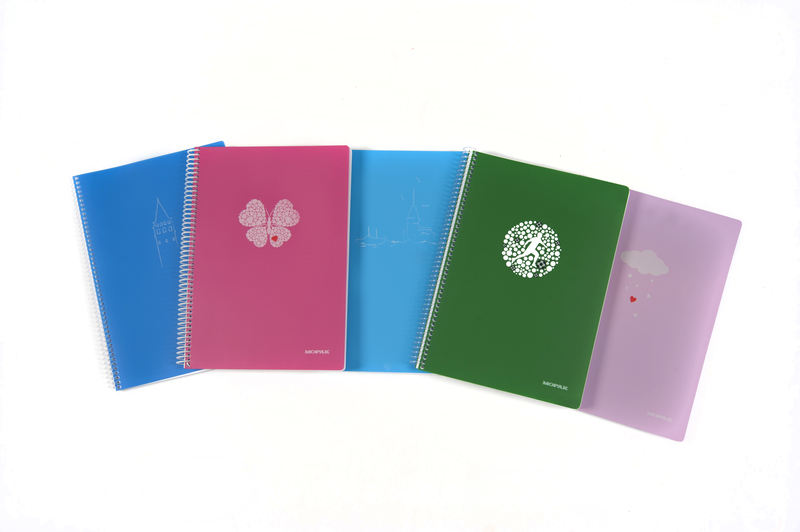 Male can prefer dark colors such as dark-blue and black and simple and plain desings and pale and steel-tissued MOPAK Notebooks while female can select tens of notebook types having different tones of vivid and pastel colors and small stories. In music notebooks, not only covers, strengthening our link with music with special sentences, but also information of famous musicians about their lifes inside of the cover is drawing attention. Various stories, quatations and puzzles, which you face not only in music notebooks but also in all series, aim to provide pleasant minutes. Take care while buying notebook! Page color shall be net and clear white. Lines on the page shall be neither too faint nor too bold to distract attention. The red line of the left side of the page shall be straight – this line allows distinct paragraphs in small ages. Page shall be so thick that pencil trace cannot be visible on the back page. Page shall be durable and it shall not be worn while erasing with an eraser. Cover shall not be folded easily. You can reach all these criteria, known as notebook quality criteria in fact, with MOPAK Notebook, which you can find in outstanding stationery and sales points.